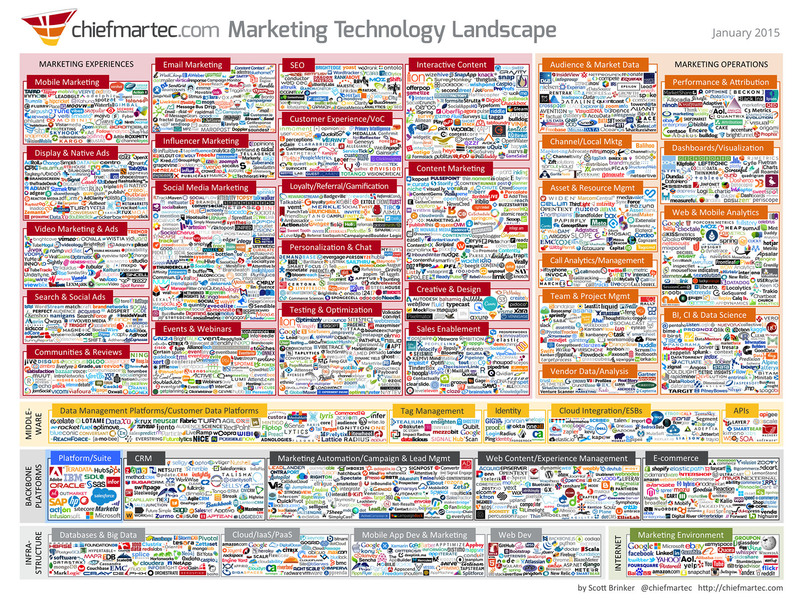 The 2015 edition of the Marketing Technology Landscape produced by Chief Marketing Technologist blogger and industry commentator, Scott Brinker, features 1876 companies and open source projects operating in the marketing technology space across 43 categories. That’s double the number of players featured in 2014. While claiming the list was not comprehensive, Brinker said the list of companies showed cloud-based marketing software startups are “blossoming at an incredible rate” and outpacing consolidation occurring at the larger end of town. Reflecting this consolidation is one of the most significant changes to Brinker’s landscape for 2015: A new “platform/suite” category representing technology vendors who are aggressively building out an integrated suite of marketing technology solutions aimed at marketers. This list of vendors features longstanding IT heavyweights like Oracle, IBM, HP, SAP, SAS, Microsoft and Teradata, along with growing digital marketing and customer experience management vendors such as Adobe, Sitecore, Marketo, Act On, Outmarket, SDL, HubSpot and Infusionsoft. At the heart of many of these platform plays is the acquisition and integration of core technologies such as marketing automation, campaign management, customer experience management, data analytics and social listening tools. According to VentureBeat, the marketing technology space experienced US$6.2 billion in funding and acquisitions just in the last three months of 2014. The list of acquisitions just represented by these platform vendors in recent years is significant. Adobe’s acquisitions include campaign management provider, Neolane, marketing analytics software vendor, Omniture, customer interaction specialist, Day Software, data management platform startup, Demdex, and video platform, Auditude. Salesforce’s shopping list in recent years, meanwhile, has included the purchase of email campaign management and marketing software platform vendor, ExactTarget, social media marketing platform, Buddy Media, and social media monitoring tool, Radian6. Oracle has also been on a buying spree, acquiring marketing automation platforms, Responsys for US$1.5bn and Eloqua for US$871 million, along with data management platform, BlueKai and most recently, consumer spending data vendor, Datalogix. Other notable acquisitions in the marketing platform space include IBM’s purchase of marketing automation vendor, Silverpop, and SDL’s acquisition of marketing automation vendor, Alterian. 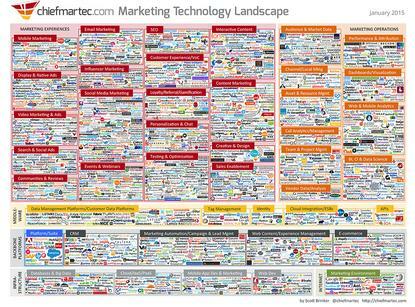 “Marketing technology has a dual narrative these days: Consolidation, as major players like Adobe, Oracle and Salesforce acquire large portfolios, yet also diversification, as the rate of new, innovate startups outpaces the rate of acquisition or failure,” Brinker said following the release of the 2015 Marketing Technology landscape graphic. “Accordingly, the majors are now pursuing platform strategies, co-opting many smaller companies as ISVs [independent software vendors], which helps make it easier for marketers to integrate them. According to the latest forecasts from analyst firm, IDC, the will be worth US$22.6 billion, rising to $32.3 billion by 2018.